Bringing a new drug to market is a paperwork-intensive process, and much of the paper goes to the Food and Drug Administration. 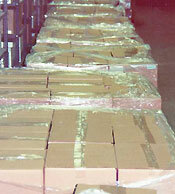 FDA often receives more than a palletload of documentation for a new drug application. This is the paperwork for one drug. 'When an application comes in, it might be delivered on a pallet,' said Randy Levin, associate director for electronic review in FDA's Center for Drug Evaluation and Research (CDER) in Rockville, Md. The archived copies for a single application can run to hundreds or thousands of volumes, not counting the copies used by reviewers or the ongoing test records and post-marketing data that must be submitted and maintained by drug companies. Since August 1997, FDA offices have had the option of accepting such documents in electronic form'an option CDER has taken advantage of. 'All of that can come in on a digital tape,' Levin said. The tape, once mounted on a network drive at CDER's main office in Rockville, makes the documents in Adobe Portable Document Format available to FDA reviewers from Maryland to Missouri. 'The logistics are much easier just to preserve the documents and move them around,' Levin said. It also is easier to extract and manipulate the data electronically. CDER, along with the centers for Biologics Evaluation and Research and for Veterinary Medicine, was one of the first FDA offices prepared to accept electronic documents. CDER began receiving them in 1997. Not all submissions are electronic, however'in fact, fewer than half are. But last year, 250 submissions came in electronic format, and in March alone, 40 electronic submissions arrived. 'The pace is picking up,' Levin said. Last year, 58 companies submitted electronic documents. The paperless move was a long time coming, said Paul Motisse, FDA consumer safety officer. 'We did a lot of homework going back to the early 1990s, when the industry approached us about using digital signatures,' he said. The problem was, federal regulations did not allow for digital signatures. Title 21 of the Code of Federal Regulations for the pharmaceutical industry contained 132 references to physical signatures. So FDA geared up for a massive overhaul of signature rules, soliciting comments about proposed new rules in July 1992. The final rule, Part 11 of Title 21, took effect in August 1997. It specified minimum standards for records maintained by drug companies and for documents that must be submitted to FDA. Included in the standards are requirements for digitally signing and tying signatures to the documents. Now, as federal offices face a 2003 deadline for accepting electronic paperwork, 'Part 11 is emerging as a model for other parts of government,' Motisse said. Companies that maintain electronic copies of documents required by FDA must use digital signatures that are tied to the signer'usually by means of a digital certificate'and to the document to prove legally that it was not altered after signing. Some companies use ApproveIT from Silanis Technology Inc. of Dorval, Quebec, to tie digital signatures to documents. ApproveIT encrypts a signature using a public-private key pair and can provide an X.509 certificate to authenticate the signer. CDER avoids the need for a separate certificate authority and public-key infrastructure by not accepting signatures digitally. Everything that requires a signature must be submitted on paper. 'We don't require a signature on every document,' Levin said. For every three or four pages that must be signed and submitted on paper, there are gigabytes of data that can be handled electronically. 'When we first started this, we archived the equivalent of millions of pages electronically,' Levin said. The agency hasn't kept a page count, but last year it stored 200G of electronic data. CDER has no plans to set up a system to accept digital signatures. Electronic documents reside on one or more servers running Microsoft Windows NT in each CDER building, most of them located in Rockville. The three main buildings are connected by a Fiber Distributed Data Interface network. Another five buildings link to the network by T1 lines. Each floor has a 10-Mbps Ethernet segment. CDER has enough equipment and wiring to take switched Ethernet to each desk, said Greg Brolund, associate director for technology and policy for CDER's information technology office. Eventually the network will be converted to Fast Ethernet with switched Ethernet to desktop PCs, but boosting that bandwidth is not a priority until the T1 links are eliminated, Brolund said. Only two remote buildings, one in Beltsville, Md., and one in St. Louis, will retain their T1 lines, he said. Meanwhile, CDER is expanding the kinds of documents it can accept electronically and is trying to help reviewers adapt. 'We're a paper-oriented society,' Levin said, and some people accept the change to electronics more rapidly than others. An upgrade to 19- and 20-inch monitors has made an entire page readable at once. Some users have dual monitors to ease searches and comparisons.